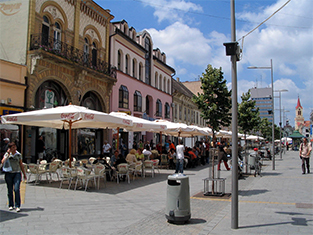 The city of Zrenjanin (German: Großbetschkerek, Hungarian: Nagybecskerek) has about 76.000 inhabitants and belongs, along with Kikinda, Pančevo and Vršac, to the most important cities in the Serbian part of Banat. In Serbian, the city has had several names: until 1934 it was called Bečkerek, until 1944 Petrovgrad (after the heir Petar Karađorđević). Since 1944, the city is called Zrenjanin after the folk hero Žarko Zrenjanin. In 1326, the name Becskerek was recorded in writing for the first time. The settlement emerged on the shore of river Bega. The river meanders through the landscapes creating moor- and marshlands in which small islands and peninsulas can be found. In the first half of the 15th century, Zrenjanin was already recorded as a small city. In 1551, the city was conquered by the Ottomans. After the liberation from Ottoman rule, the city was mostly settled by Serbians and was administrated from Vienna, like the rest of Banat. 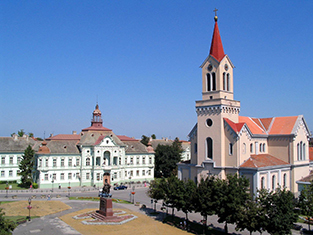 In 1769, Zrenjanin was given the status of a free trading town and entered the Hungarian county system in 1778. Due to the small population number in Banat, the Vienna Court organised a colonisation of the region and settled lager groups of Germans as well as Spaniards in the city. The latter called Zrenjanin “New Barcelona”. The settlement of German began as early as 1724, but many settlers died of the unhealthy climate and the Spaniards fell victim to the same problem. Only in the 1780s, successful colonisation began. During abolitionism, Zrenjanin developed into a trading and craftsmanship centre. The inhabitants – Serbians, Germans, Hungarians and Jews – were successful merchants and craftsmen. Mills and oil mills were constructed and Sebastian Krazeisen established the city’s first brewery in 1745. In 1807, the city was largely destroyed by a fire and many buildings, but also historical documents were lost. The county building (today’s town hall, trg Slobode 10.) had to be built anew as well. The baroque building was erected after plans of Josef Fischer in 1820. From 1885-1887, it was remodelled in neo-baroque stlye after plans of Gyula Pártos and Ödön Lechner, the famous art nouveau architect. During the construction work, parts of the old castle, which was demolished in 1711, were found. Due to the urban and cultural developments of Zrenjanin, many grand buildings were constructed during the 19th century such as the theatre or the casino. The city’s first printing shop was founded in 1845 by Franz Paul Pleitz who came from Regensburg and soon became one of the most important publishers of the region. 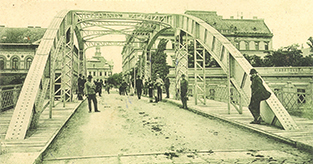 After World War I, Zrenjanin became a part of Yugoslavia. Today, the city belongs to Serbia. The Catholic church and the town hall.